There’s a world of augmented reality that needs no glasses, goggles, or smartphones. All it takes is being present, experiencing a space in real life. That’s the world that Portland, Oregon-based designer Craig Winslow plays in. Craig is a projection mapping artist who augments real-world spaces with light and animated imagery shone upon it. His work simultaneously evokes the past, present, and future. Most recently, with his series Light Capsules—an idea he came up with during an especially stress-filled time and more fully developed during his year as a creative resident with Adobe—he’s been inspired to recreate ghost signs—old, abandoned hand-painted letter signs on buildings and billboards—in spaces across the globe. In the latest episode of Making Ways podcast, Craig talks all about the ambitious Kickstarter campaign he launched that transformed his cross-country move from Portland, Maine, to Portland, Oregon, into a 15-day moving art installation. Each day, Craig and his friend Mike Ackerman delivered new projections and video documentation to Kickstarter backers. This daily grind forced Craig to find interesting solutions to the problem of “what should we make today.” The answers, it turned out, were right in front of his face. He went on to describe that innate feeling that comes upon anyone with a deadline looming, just as if there was an axe swinging overhead or a bear lumbering into your cave––in those situations, there’s flight and then there’s fight. Craig’s creative MO is always to choose the latter. He said, “It feels almost like an animal attack in a primal sense, like you are being held down, and you have that one defense mechanism to lash out. . . .To solve a creative problem, I’ll just try and do something completely different or add another project to my list. But sometimes that random moment of stress to create another project can become the basis for a whole new series or avenue to explore creatively.” It’s that crunch time that brought clarity to Craig and inspired his yearlong creative residency project with Adobe, Light Capsules. Craig recommends, “At some point you have to burst out of that moment. . .and get to something incredible.” So whether you are pursuing a business venture or a creative project, crank up the heat and make pressure your partner in productivity. To learn all about Craig’s journey from imaginative kid growing up in Maine to projection light artist working with some of today’s most amazing brands, listen to the full episode of Making Ways. 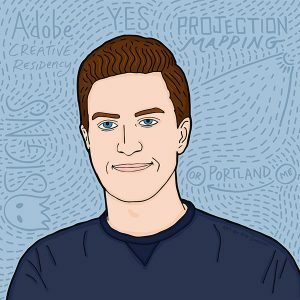 And check out Craig’s site, his Instagram account, and the Adobe Creative Residency page to explore his work.